St. Brendan (ca. 484-577) was one of the most famous of the Celtic pilgrims, renowned not only for the piety of his life and for founding several monasteries in Ireland, but also for his amazing voyages west over the open seas in one of these small boats which were (and still are) called coracles. It is certain that on his longest voyage he and his fellow monks made it as far west as Newfoundland, and there is good reason to believe that he even made it farther south on the North American continent. 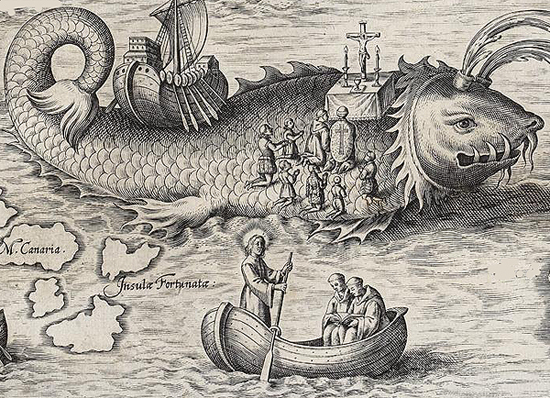 The written account of his journey, "The Voyage of St. Brendan", became a 'best-seller' for a thousand years as sort of a combination of adventure story and devotional writing. He is considered to be a patron saint of pilgrims and his feast day is May 16. At times, St. Brendan, out on a small boat at seas with his fellow monk, would direct them to pull in the rudder and just let the wind take them where they should go. He said, "Is not God the pilot and sailor of our boats? Leave it to him… he himself guides our journey as he will." Peregrenatio, the spiritual discipline of pilgrimage, stands as one of the most enduring legacies of the Celtic Christian tradition. Ian Bradley writes in The Celtic Way, "Peregrenatio was the outward symbol of an inner change, a metaphor and a symbol for that journey towards deeper faith and greater holiness and that journey towards God which is the Christian life." But this journey also had a profoundly outward element. Indeed, in the second half of the first millennium much of northern Europe was evangelized because of these simple, wandering saints who carried little but a Bible and a staff. They were the first to carry the gospel message to N. Europe and founded monasteries in Scotland, England, France, Belgium, Germany, Austria, Switzerland, and down into Italy. Are You A Spiritual Director? Corhaven. What does it mean? ‘Haven’ is obvious. It is a quiet place of refuge and sanctuary, a place of shelter, safety, and peace. Over the centuries, ‘haven’ has often been used as another word for a port or harbor, which implies a place on a journey where the traveler can come out of the wind and waves and find rest, and refreshment. The Latin word for ‘Heart’ is ‘Cor’. The heart is the center of our selves, the seat of our emotions, and in some usages it is another word for soul. Our heart is the depth of our souls and selves. So put together, Corhaven is a place of shelter and sanctuary for the heart. And this implies somehow the presence of God, for as St. Augustine said, “Our heart is restless ‘til it rests in You”– Inquietum est cor nostrum, donec requiescat in te. We took a long time discerning the name of this place–17 acres of field and forest in the Shenandoah Valley–and sought the counsel and inspirations of many friends. Many suggestions and affirmations were offered, and some of those suggestions will find their way into whatever emerges here. But two things in particular have led us to know that this is a good and right name for this small piece of God’s good earth. After the surprise possibility of moving here came unexpectedly for us out of the blue on Easter Monday, 2009, it was on the June 19 following that we knew with deep certainty, for the first time, that this was to be. Going to the Basilica in Washington DC to thank God for that, we were blessed to find that June 19 was (not coincidentally) the Feast of the Sacred Heart of Jesus. 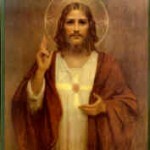 Since the earliest days of the Church, the sacred heart of Jesus has been seen as a deep symbol of the love of God, with clear devotions and reflections emerging in the 11th century, then marking the ministry of St. Bernard of Clairvaux (c. 12th cent), founder of the Trappist monastic order. 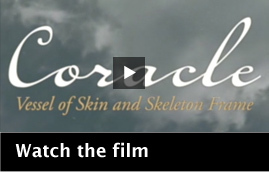 The French for ‘Sacred Heart’ is ‘Sacre Coeur’. Corhaven is dedicated to Jesus, and particularly the love of God manifested through his heart. Corhaven is offered that any who come and the many who do come would know God’s love here, and share God’s love wherever. Then, late in our listening for the name, a last thing solidified the sense that Corhaven is right. 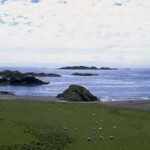 Among the many favorite and sacred places for us around the world, is that “thin place” of the Island of Iona off the west coast of Scotland. It was there in 563 that St. Columba landed and founded a monastery that would nurture the worship of God and spread of the Gospel for centuries. The small beach on the southern tip of Iona is a place of great meaning for us, and it was on this beach in that year that Columba’s small boat, a coracle, came to shore and he stayed. That pebbly beach in Gaelic is called, ‘Port a Churaich’, or in English, ‘Haven of the Coracle’. So, Corhaven…a sanctuary for the hearts of those on a journey, where God can be found, where the love of his heart can be known. The motto here is Caritas et Veritas–Love and Truth. 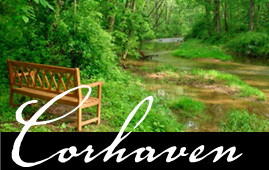 Corhaven is a “retreat home” nestled in the Shenandoah Valley offering solitude and retreats for individuals or larger groups. Get help for the journey. Need further information? Have a question?